Hi Ray, I'm afraid those are not the boxes, but they may work with some hot glue . Anyway, I'm confident there will be 3D models available for printing a custom box. I'll keep you all posted. I'll see if I can come up with something. Thanks for your comments. 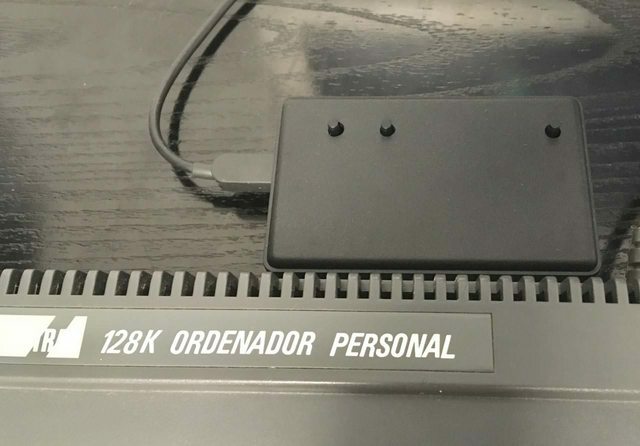 it seems interresting, I'm looking for a "ramcard" (to use Parados, etc. ), will it do the job?Whee can I buy it? (price? )Thank you. I'm afraid this card has no extra RAM. However, parados is a AMSDOS replacement ROM. Could you be looking for a "rombox" instead of a "ramcard"?. There are many good projects for romboxes out there. This card is not finished yet, I expect some online retro-shops will build and sell them once is ready, most likely this fall. Or if somebody can convert ?? I don't believe it is useful to run parados as a standalone file. However. 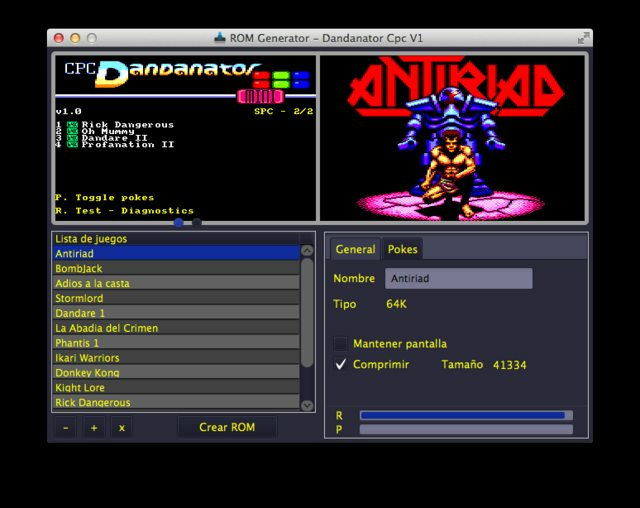 Parados could work as a hi rom in the dandanator as it features an auto rom replacement function. However, as I wrote a couple of post above, a Rombox seems to be what you're looking for since Dandanator is somehow limited for this purpose. I was just looking for options for the Dandanator that may work. I believe CPC Dandanator is ready for prime time now . - Loads 64/128k compressed games from a a menu in 1 to 3 seconds, depending on compression and size. 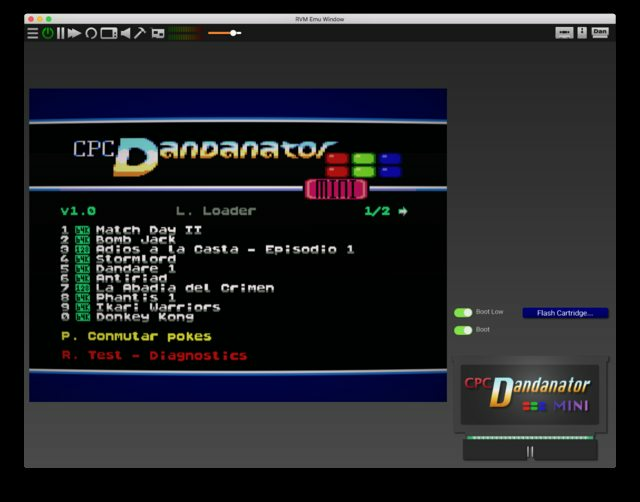 - Includes a CPC testing rom that can be booted without no RAM/Keyboard intervention. - Updates itself from USB. - Zero configuration, just plug & play. - components, including case, under 10€. Targeting at around 20€ Recommended selling price. - Public Domain, open source, open hardware, no licensing whatsoever. Do whatever you want with it or parts of it. I'll be posting all project details after summer. I'll probably organize a small batch as well and contact retroshop.pt and other HW sellers that showed interest in selling these. Remember, it's a public domain project. Anyone can make/sell their own boards. No need to even tell me about it. Credits: Java program by overCLK, parts of Z80 code by Mad3001, Zx7 compressor by Einar Saukas, Logo by Pagantipaco, Test Rom by McLeod. PD: We have a ton of new features in the pipeline for next releases. wow, looks great... willing to have one. Also, is the trainer/poke function of the ZX version gone? Nice menu, nice specs. Great work! The board fits around 14-18 games, so only two pages of games are shown (10 games max each). You can change page with the space bar or with left/right cursor or joystick. I see it's now on sale, but only on the spanish forum (apologies, just saw the tweet last night and don't have the URL)? Hi, that's correct. I organized what I thought it was going to be a small batch for the local Amstrad users, 50 units. So far there are 120 units reserved and I'm afraid I can't build more in this first batch. I don't know at the moment if I'm going for a second batch anytime soon, but I'm putting together all documentation to make the project public domain. 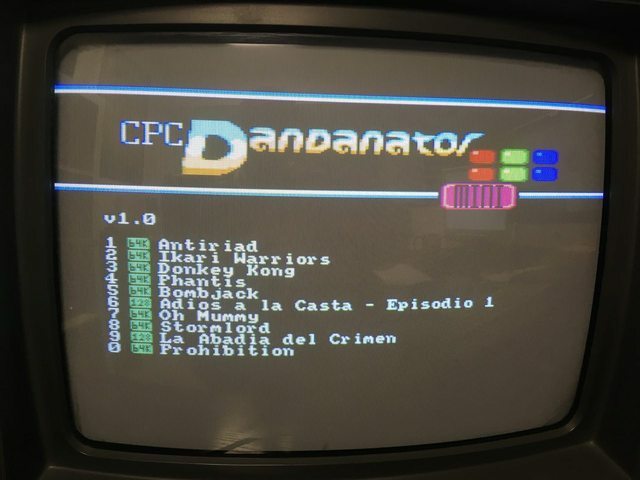 Also, I'll send all specs to Ricardo, at retroshop.pt so he can produce and sell the CPC dandanatos. He is already selling the ZX Dandanators and has shown interest in the CPC ones. As a quick overview. Pokes are already there. I have asked permission to Richard, author of the winape emulator to integrate his poke database as well. Also, board is designed to fit into a commercially available ABS box, the Supertronic PP6N. This first batch will include the box, machined with the necessary holes from factory. 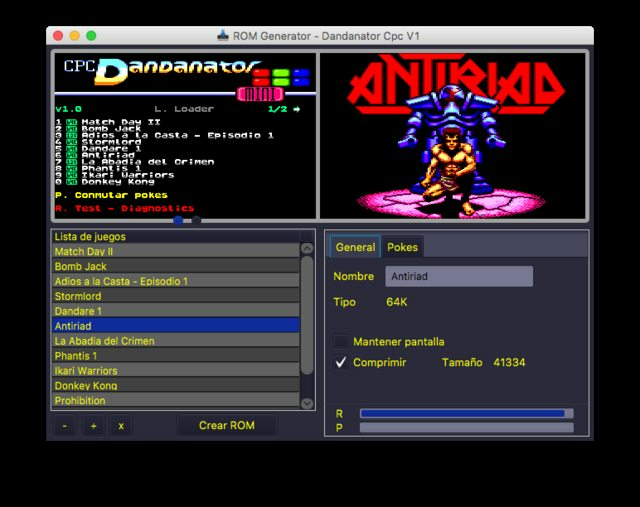 RetroVirtualMachine V2 and Arnold will emulate the CPC Dandanator. 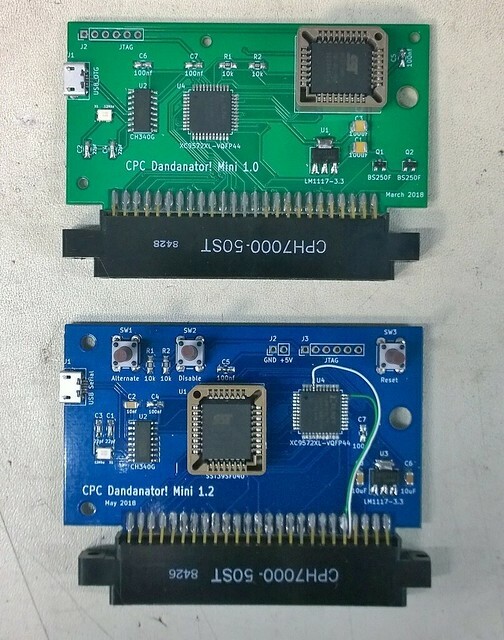 4Mhz, Spanish CPC developer group, has adopted the CPC dandanator as its distribution format. All new games will be physically sold in a cartridge. Among other things, this enables their games to run in 464 computers, not only 6128. USB is used for changing the contents of the cartridge. First batch is going to be delivered by late September, I hope, assembled and in the plastic box. Price is 20€ + p&p. I believe it is a great solution to market new software developtments -taking into account that it is getting hard to find disks reliable enough to distribute any program on them. Btw, the RAM test program included is very useful to diagnose broken memory ICs! 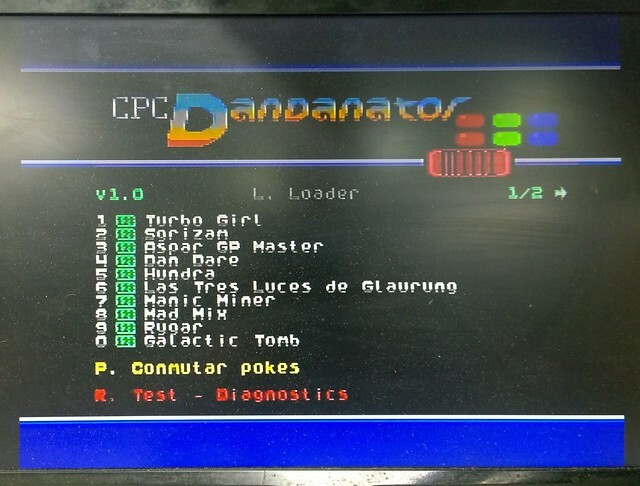 Do you have a link to the Docs (English) Please for the CPC Dandanator. I am sorry, Dandare has not yet published the documentation for it. But take it for granted that you will have a proper manual & schematics once it is ready to use! Is it still only for folks in Spain? Hi, I'm afraid the current batch is sold out. I never imposed a nationality limitation on the list, but it was already sold out in five hours, so almost all of them will be shipped within Spain. Nevertheless, I already sent the schematics and files to Retroshop.pt and Ricardo is building a test batch, so he may put them for sale soon. Bear in mind that this is a Public Domain project. All schematics and files will be published very soon and anyone can do with them whatever he/she likes. No limitations, no licenses... nothing. With the ZX Dandanator for spectrum I did the same thing and many people have built their own boards in forums, others are selling them on eBay or SellMyRetro.... same thing here. Page created in 0.252 seconds with 110 queries.